Virtual Jungle: Danton booted off Facebook for being "fake"
Danton booted off Facebook for being "fake"
Why doesn’t Facebook allow fake names? Facebook is built around real world interactions. Operating under an alias detracts from the value of the system as a whole. Users who operate under fake names are also prone to abuse. We take this standard very seriously and take down fake accounts as we become aware of them. There was more in the FAQ, but the above states it clearly: Facebook considers Danton Sideways to be a fake. Facebook seems to be a game behind in its failure to understand the reality of virtual identities. Facebook did leave me the possibility of sending an email of appeal. Here is what I wrote: "I use this account to communicate with my many Second Life friends, whose real names are unknown to me." I'll post their answer in the comments. Unfortunately, our systems detected that the name on your account might violate our standards. Facebook requires all profiles to be associated with a full, real name that corresponds to a single individual. Please provide the following information, and we will gladly re-evaluate the status of your account. I'm still wondering how to answer. 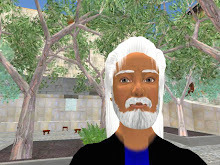 If I give my name as Danton Sideways, and say that I want to use the account to stay in touch with Second Life avatars, then I violate the rule that says I must use my real name. But if I give my real name, thereby admitting that Danton Sideways is a pseudonym, then I prove that I have violated the rule that says I must use my real name. This is called a double-bind. I have no Facebook for my RL typist, I just set one for myself in SL. But DD Ra was too short for Facebook, so I have gone for Dandier Steel (an anagram of my RL name) to set à Facebook for DD Ra. Once more, being honest and overt with facebook has shown not being efficent. I would suggest you giving your SL identity, the primary use as it is (to connect with other people in SL)... and wait and see. And I personnaly gave the number of my second phone to facebook, witch makes my account "verified" (after aswering a SMS) maybe you could do that too. It's a shame I didn't see this article sooner. Facebook disabled my account back in Feb of 09 claiming it was a fake name. Where they even got the idea it was fake is beyond me. At one point they demanded valid government issued ID, while at the same time refusing to identify themself completely, including giving me a real email, address and phone number for Facebook. Anyway, just thought you'd like to know there are more of us out here.